THE DROP is an extreeeeeemely slow burning thriller with a fantastic punchline that probably comes about ten minutes too late for the audience. Still, it's well-made, well-acted and as grimy as one would hope from a film based on a Denis Lehane novel. The film stars Tom Hardy (BRONSON) as Bob - a bartender in Brooklyn so self-effacing he almost looks mentally challenged. As the film opens he rescues a small battered puppy from the trash can of a similarly vulnerable woman called Nadia (Noomi Rapace - PROMETHEUS). Naturally they bond, but incredibly slowly as only two introverts can. Meanwhile, the personality hole is filled by James Gandolfini playing a kind of comically unsuccessful version of Tony Soprano - the guy who thought he was something, but was never the guy who was feared, and ultimately ended up losing his bar to the local Brooklyn Chechen gang. This kind of sets up the story. We have the bar being used as a drop for mafia money that some or other people are trying to knock off. We have Nadia's psychokiller ex boyfriend Eric trying to get his dog and girlfriend back. And in the midst of it we have mild-mannered long-suffering Bob. To say more would ruin the plot twist but all I would say is to go in patient and delighting in the language and the pauses and then just hold on to the finale. 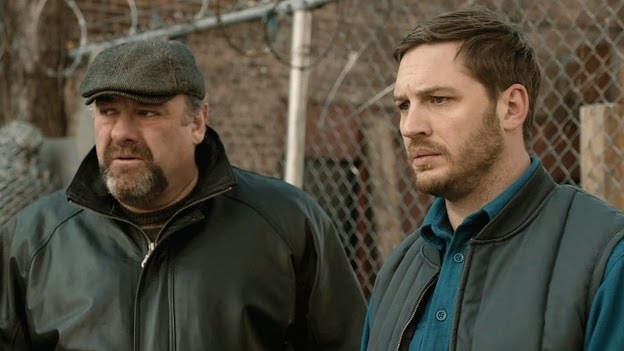 Tom Hardy, Noomi Rapace and Matthias Schoenaarts in the three main roles seem, to me at least, to do a great job with their Brooklyn accents and to utterly feel their roles. Gandolfini is a a bit more on autopilot but let's not disrespect the man in his final film. Is the film perfect? By no means. But the payoff is worth it, even if it takes some getting to. THE DROP played Toronto and London 2014. It was released earlier this year in the USA, Canada, Belgium, Luxembourg and Spain. It opens later this month in Singapore, Azerbaijan, Hungary, the Netherlands, Russia, Estonia and Kenya. It opens in November in Greece, France, the Philippines, Armenia, Australia, Belarus, Hong Kong, Iraq, Kazakhstan, Lebanon, Malaysia, the UK, Ireland, Poland, South Africa, Portugal, Taiwan, Vietnam, New Zealand, and Norway. It opens in Germany on December 4th, Finland on December 5th, Argentina on December 11th, the Czech Republic and Slovakia on January 8th, and Italy on March 19th.